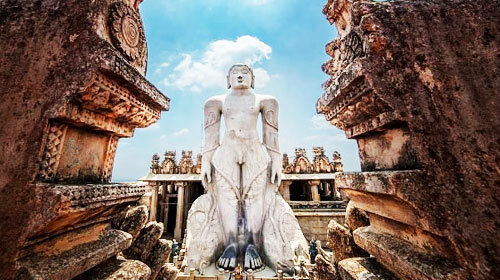 Shravanabelagola is a town located in the district of Hassan and lies 144 kilometers from Bangalore. The name ‘Shravanabelagola’ means “White Pond of the Shravana”. Shravana is oneamong the Nakshtras in the Hindu astronomy and the white pond refers to the pond located in the middle of the town. The Shravanabelagola is where the world’s largest monolithic statues is located. The Gommateshwara statue which is 57 foot high is a state representing the Jain god, Bahubali meditating motionlessly, standing on the ground. The statue can be viewed from anywhere in the town. As the Jain texts mention, Bahubali was the son of Rishabanatha and was said to be of superior strength and valor compared to all his brothers. He mastered in medicine, archery and the study of precious gems. As his father divided his kingdom equally between all his 100 sons, 98 submitted their kingdom to the eldest brother all except Bahubali. Hence a fight ensued between the two brothers where at one point Bahubali raised his hand to kill his brother, he was struck with disgust at the ways of the world. He immediately gave up all his worldly possessions, even shed his cloths and went to the forest to meditate. He meditated in a standing poture, motionless for many years that vines and creepers began to grow around his body. No specific dress code is needed to visit this place. The Mahamastakabhisheka which takes place once every 12 years refers to the abisheka for the Jain statues and the most celebrated Mahamastakabhisheka is done for the Gommateshwara statue.